National Chairman of the All Progressives Congress (APC), John Odigie-Oyegun, has stated that had President Muhammadu Buhari not put in place various diversification efforts upon his assuming office in 2015, Nigeria would have collapsed. He said the present administration was building a new economic model which will be sustainable, production-based and will diversify from oil to agriculture, solid minerals and other viable sectors. Odigie-Oyegun said this at the APC National Secretariat in Abuja when he received political leaders from Delta Central Senatorial district, who defected from the Peoples Democratic Party (PDP) to the APC. The decampees were led by Johnson Boro, former Commissioner in the Delta State Oil Producing Area Development Commission (DESOPADEC). 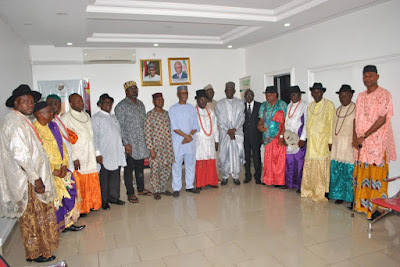 Other decampees are: Immediate-past PDP Chairman, Ughelli South LGA, Francis Aguonigho; Sleek Oshare; Isaiah Kekeje; Mathew Kwode; Robert Ojo; Sunny Ogbududu; David Edonor; Comrade Saturday Nukueye and Charles Otaiye. The APC National Chairman stated that with the globally decrease in the demand for oil, Nigeria’s economic mainstay, the need to diversify the Nigerian economy has become increasingly imperative. He added that the efforts of the Buhari administration will be evident in a few years as the country will be counted as one of the industrial power houses in Africa. 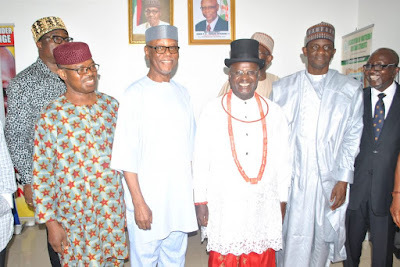 Odigie-Oyegun said: “Economically, things are difficult, there is no question about it. But in spite of that people of your quality sat down and still want to join the boat, because you have seen the future and you know the future belong to a changed country. A country that produces, not only consumes. “In the last sixteen years of previous administrations, we just consumed. Thank God this nation brought President Buhari at the point it was about to collapse and all we are doing today is putting the pieces back together again. It is a difficult experience and as a result of that our people are going through some hardship. But there is no question at all, that you can see the silver lining that is on the way. “By the end of this year, we will be net exporters of rice, today we have started to export formally yam. Today we are about certain that all the grains in this country can be produce locally. These are all part of the building blocks towards the Nigeria that we foresee in another year or two. So, tremendous is progress is being made to reverse the road at which we were travelling, to build a new economy, an economy based on what we can produce. An economy based on agriculture, based on our solid minerals. “It is clear today that oil is gone. Britain has declared that in 40 years vehicles that consume fossil fuel will be phased out. The United States of America and other countries of Europe have made similar declarations. So it is fortunate that President Buhari is today in office taking us painfully through the process of change such that this nation will be counted in another few years as one of the industrial power houses of the African continent.”. 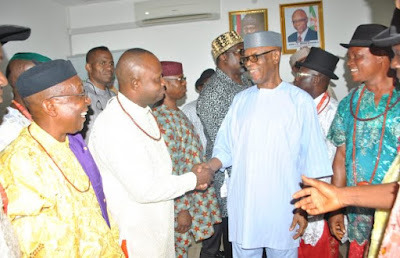 While welcoming the new entrants to the APC, Odigie-Oyegun said one of the resolutions of the Party’s National Leadership was to bring the South-South back into the mainstream of Nigerian politics. The APC National Chairman described the zone as one of the “strongest pillar for unity” in the country. “I cannot resist but speak like somebody from the South-South on this very special occasion even though I belong to the nation as APC National Chairman. “The point about us is that we are not tribal. The South-South is perhaps the strongest pillar for unity in this nation. The reality about the South-South is because we believe in the unity and oneness of this nation so strongly, we are ready to work with anybody who stands for one nation and one Nigeria. “Today, two years now we have a new regime of change. Unfortunately to a large extent, we missed the boat. We have only one state in the entire South-South, Edo State. It is our resolve here at national headquarters to bring the South-South back into the mainstream of Nigerian politics. Because at the greatest point of danger for this country, it was the South-Southerners that stood firm at risk to themselves, at risk to their lives that this nation must remain one,” the APC national Chairman said. He said with the new entrants from Delta Central, another solid block had been added to the APC’s aspiration to bring Delta State and indeed the South-South into the Progressives fold. “I know how crucial central is in Delta state and with your entry into the Party, we have firmed up the central and can project from there to take Delta State and eventually take the entire South-South. Today we are adding one more solid block towards the unity, development and great of this country. “I am aware there are scores of you, but because the ceremony is taking place at the National Secretariat, we had to limit the number of persons who could come, I know that at the appropriate time we will have a great big unity rally in Delta state where all those who have joined us in the recent past will be formally received and where we will also formally launch the movement for the recovery of Delta state,” the APC National Chairman said. Speaking earlier, the APC National Vice Chairman (South-South), Prince Hilliard Eta said the defection of the PDP leaders from Delta Central to the APC was testimony of the paradigm shift being witnessed in the South-South. Chief Johnson Boro who led the decampees thanked the APC leadership, particularly the National Chairman for the reception. “We are extremely delighted with the reception you have accorded us today. We now believe that we are coming to a home where we will be accepted.“ He said. Other APC National Working Committee (NWC) members at the meeting included: National Secretary, Hon. Mai Mala Buni; Deputy National Chairman (North), Sen. Lawal Shuaibu; Deputy National Chairman (South), Engr, Segun Oni and Deputy National Secretary, Hon. Tombari Giadom.